Creating throwaway email accounts is nothing new. But Microsoft has just made the process a whole lot easier with a new Hotmail feature that allows users to simply manage multiple email address through a single inbox, according to The Windows Blog. The reasons for creating throwaway, or multiple, accounts can vary from person to person, of course. But it’s a great way to deal with spammers, manage various online services, or just brush off people you don’t actually want to keep in contact with. The new feature lets users create up to five separate aliases. The messages for each of these addresses will be separated into their appropriate folders, and can be read and replied to from one inbox. Microsoft says it hopes to increase the number of aliases to 15 for those of us with intense email needs. Yahoo offers a similar feature, but that requires paying the $19.99 per-year fee to upgrade to its Mail Plus service. The Hotmail alias function, on the other hand, comes standard. As Mehta mentions, however, the feature may not appeal to “mainstream” email users, and instead only interest a select group of email “enthusiasts” who require additional functionality, and the use of multiple addresses. 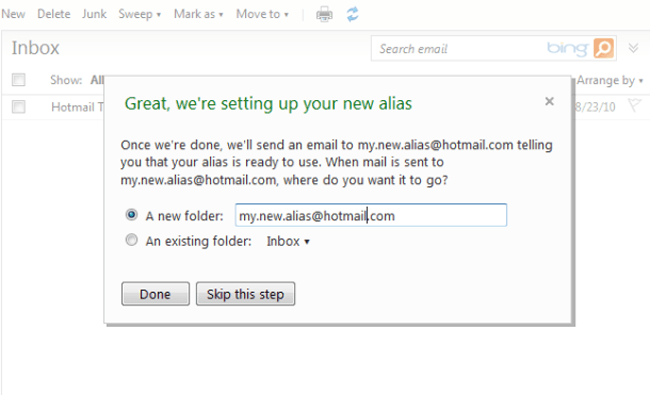 The feature is expected to be available to all Hotmail users by this afternoon.